A Licensed Tour Guide will provide a detailed en route commentary and also accompany and guide you around the historical sites, temples and fortified cities. The same as a Licensed Tour Guide, however the commentary will be provided in several languages but not usually more than 3 languages per tour. A driver guide/host is not a qualified guide but is a person who is knowledgeable about our islands. He/she will give you general basic information en route but is not permitted or licensed to accompany you around historical sites, temples and fortified cities. Guided or Recorded commentary during a cruise. You will be provided with an audio guide or earphones to listen to a commentary in language of your choice. This tour is offered in the languages displayed. You can select the language of your choice when you book the tour. This tour includes some of central Malta's highlights and our first stop includes a visit to the town of Mosta. 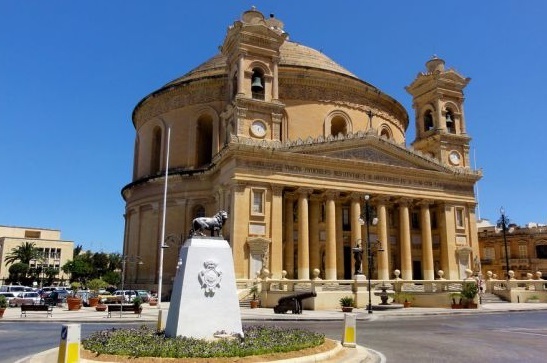 Dominating the central piazza is the Rotunda church, more commonly known as Mosta Dome . It is probably the most famous church in Malta, mainly because of it's large dome which is the fourth largest unsupported dome in Europe. For many visitors the most fascinating feature of this church was the World War II incident when during an air raid a bomb pierced the dome and fell inside the church during a service which was attended by 300 locals, but the bomb failed to explode and this the locals hailed as a miracle. You can visit the sacristy which displays the events and houses a replica of the bomb. 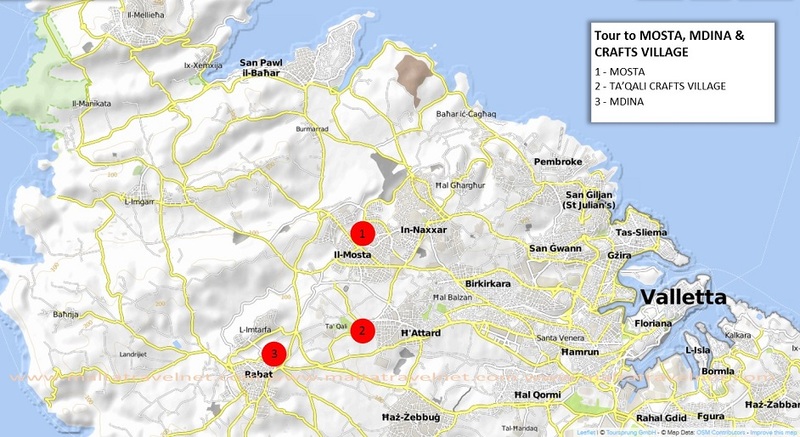 Our next stop is the Ta'Qali Village. Ta'Qali was once the British RAF base in central Malta, this old air field is now home to our National Football Stadium, a National park, conventions centre and Crafts Village which houses an array of artisans. Here we can view the local crafts and it is also the ideal place to purchase some gifts from a good selection of locally made pottery and ceramics, filigree and jewellery, cane works, stone and much more. Do not miss out on the glassblowers – decorative glass made in the traditional manner by hand and mouth; also etching and crystal cutting. Our final visit is to the medieval city of Mdina. Mdina is built on a plateau in the centre of the island, the city's old Baroque buildings, Cathedral and magnificent bastion walls dominate the rural skyline. Mdina, once the capital of Malta until the modern city of Valletta was built had many names including Melite (Roman occupation), Medina (Arabic occupation), Citta Notabile (Knights of St. John) and Citta Vecchia (after Valletta was built). Today it is also referred to as the Silent City since it inspires tranquility at any time of the day or night. The only way to really experience and enjoy this city is on foot, explore the quaint alleys, narrow streets, ancient buildings and magnificent far reaching views from the high bastion walls. At this stage our tour comes to an end and we make our way back. The information supplied with this tour was fairly basic and could be read in most guides. It probably suits the cruise tourists who don't have much time to spend in Malta. As with my comment above,I did appreciate the transport back to Valletta. This 'door to door' aspect of the tours is great - especially if not staying near the harbour etc. I loved the history of the Crafts Village. The quonsit huts reminded me of being a military kid. Lovely tour. Brief stops at the attractions...25 mins or so....but to be fair probably long enough. Guides pleasant and helpful as usual. Skilled driving by the coach driver through some narrow streets in Malta !